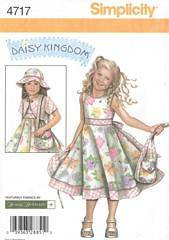 Child's dress, jacket, hat and purse pattern. Dress has raised waist and three button back bodice closing. Wide waist band extend to tie in the back. Bolero style jacket has short, set-in sleeves. Sizes 3, 4, 5 and 6 are all included. Hat is Sizes 19, 20 and 21 inches.